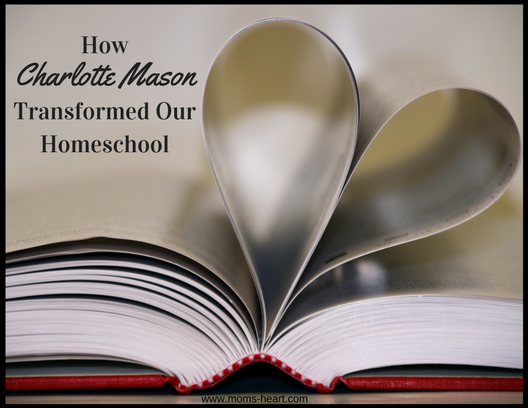 When we first decided to homeschool, I researched for a long time, but it didn't take long for me to fall in love with Charlotte Mason. This week's topic for the Virtual Curriculum Fair is Our Method of Homeschooling, and I am sharing why Charlotte Mason is important to our homeschool. If you're not familiar with the Charlotte Mason (CM) method, Charlotte Mason was a British educator in the late 1800's, and what we call the "Charlotte Mason method" is derived from her educational philosophy and the methods she used. She believed that children are born persons, they're not blank slates to be filled, they have an innate curiosity and thus need living ideas to feed their mind and soul. To facilitate this, Charlotte Mason used living books instead of textbooks, narration instead of rote memory or dull worksheets, nature study to learn about the world firsthand, handicrafts to develop skills and to make useful and beautiful items, a study of fine arts to feed the soul, and so much more in order to offer students a feast for the mind. I could go on, but I'll share some links at the end of the post, if you're interested in reading more, because I can't describe the ideas as eloquently as others. What I really want to do today is share how returning to Charlotte Mason saved our homeschool. Our Charlotte Mason Preschool years went really well, but I slowly strayed and dabbled in some curriculum that, while lovely and full of fascinating living books, wasn't particularly Charlotte Mason. I don't regret the years with our other literature-based programs, they were great for us at the time, and I would still recommend them to others under the right circumstances. I just started to feel as if something was missing in our homeschool. In hindsight, we should have just waited a year to start the curriculum we used, but eventually, we slowly made our way back. I haven't finished reading Mason's books, but I did start slowly adding in elements, one at a time. I added in fine arts (picture study, hymns, folk songs, composer studies, daily poetry), I added in copywork or dictation for the boys, we started dabbling in Shakespeare. Suddenly, I was overwhelmed and frustrated with the curriculum we were trying to use, and felt like we were at a complete standstill, with no quality progress. It wasn't producing the same joy and interest as the "extra" Charlotte Mason elements. The living books were great, but I was trying to force a curriculum and "work" around them, and it just wasn't working. So I stopped. I researched for a couple of days, and decided we were going back to true Charlotte Mason. I changed curriculum the very next week, and I can already feel the progress and intangible benefits in just one term. That sounds so dramatic, especially because I know things aren't actually perfect around here; we are all human, and we still have bad days. Overall though, I can feel the dynamic of our homeschool and our daily attitudes slowly changing, and I think this is due to a number of little things that add up to a more pleasant experience. One thing I noticed within just a couple of weeks is that the amount of complaining has reduced dramatically. That's not to say that there isn't whining or procrastinating, but it doesn't happen as often. There isn't pure dread in their eyes when I say "It's time for . . . " and I think it because of the short and varied lessons, the living ideas, and NO BUSY WORK! Sometimes, they even look forward to a particular book, because it's just that good! They are already making connections on their own. When we were doing literature-based units (not quite unit studies, but certainly not CM either), I felt like I was just fluffing out their studies and they were just going along for the ride, rushing through and unfortunately not retaining as much as I thought. When we did a streamlined, chronological history approach, they loved the history, but everything else still felt disjointed. Now that we're using a full Charlotte Mason curriculum (Ambleside Online - more on that next week) that is so meticulously and carefully curated, and following the CM methods, it doesn't feel forced. I also feel like there is just enough of a peg from one subject, for it to resonate when something comes around again in another book or subject, and they get the joy of making that connection on their own. Like when my 8 year old recognizes that the King in today's story is related to the Duke in his history biography, and was the "winning" King in one of the first battles we read when we started this curriculum. It might be interesting when I tell them how things are related, but it's certainly not as meaningful as when they realize it on their own - as evidenced by the way their eyes light up during the discussion. Ambleside Online is laid out pretty clearly, and I just have to buy the books (my preference over e-books or library) and print the schedule. I sometimes print a map, but the most effort I have to put into planning/scheduling, is creating a reading schedule for the core books. It's really that simple. Charlotte Mason's methods mostly rely on reading and narrations, so there are no worksheets to print, busy work assignments, or unnecessary projects. This means I'm not scrambling at the last minute to print something or gather supplies. When I do scramble, our days fall apart. If I stick to the basics and avoid busy work, our days run smoother and they don't feel forced into doing meaningless activities and projects. If they want to explore something in greater depth, I am happy to help them, but then it is their choice, and that just means I know the method is working - living ideas are creating curiosity! Maybe I don't. We're only one term in. I don't "have it all down" yet. I certainly don't have any long-term results, only anecdotal results from other homeschoolers . . . but the attitude adjustment, the ease of the methods, the less stress I feel, and those "aha!" moments are enough for me to feel there is so much more fruit to bare! Homeschooling, no matter what method, is trial-and-error, and ever-changing process. We must learn to adapt and learn from our mistakes, make improvements, and grow along with our children. That's what I'm doing. 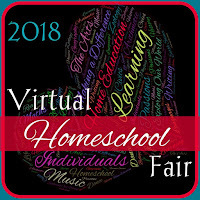 The Virtual Homeschool Fair is hosted by Susan @ Homeschooling Hearts and Minds and we have two more subjects left to discuss, so be sure to come back next week! It's so gentle, but yet so in-depth, and it's really becoming a part of our life. I had the same problem with AO when we first started, but I wish I had stuck it out, because we have circled back around to it and now we are thriving! I would start with CM's 20 Principles to get a feel for her philosophy, and then move to her works. I am glad you have been able to find what works best for you all! One of the many up sides of homeschooling is being able to adapt! Yes! I love having the ability to adapt as needed, from year to year, from child to child. It's working. I know it is. :) I've had similar experiences teaching my kids. The more I plan things out, the more stress there is and the less room there is to just "be" and explore their own interests. Much as I like the unit study idea, my kids eventually informed me that they hated unit studies. They didn't need a curriculum or a plan to show them the connections---they were making them naturally everyday. What is boils down to is this: I didn't TRUST the process enough. When I trust, they learn and we are much happier. The proof may not beimmediately apparent, but it will become obvious over time. Now that my children are in a classical co-op, the proof is in the pudding. In spite of not using a grammar textbook or having an explicit writing program, for instance, my children easily write essays and give good narrations and summaries. They have learned facts, but more importantly, they are curious and ask deeper questions than many of their classmates. Good wishes to you as you continue your homeschool journey! Thank you, Susan! I needed to hear this! Great post of information. I've tried AO years ago and really wanted it to work for us, but I'm not sure that I trusted myself to implement it fully. Maybe something to look into again as I plan our upcoming school year.